Deep into the foggy abyss of the central Bering Sea, the Pribilof Islands were found, not by sight, but by sound. In the 1800s, fur traders tracked the northern fur seal to these islands. They discovered that the seals are only there in the summer and fall. Today, researchers from NOAA's National Marine Mammal Lab track the migrating fur seals to understand where they feed in winter months and what marine resources they depend on for survival. It's early November and the team affixes a satellite transmitter to an adult female. They won't see her back on the Pribilof Islands until next July, and now that she's done shedding, they hope the tag will stay on throughout winter and spring. 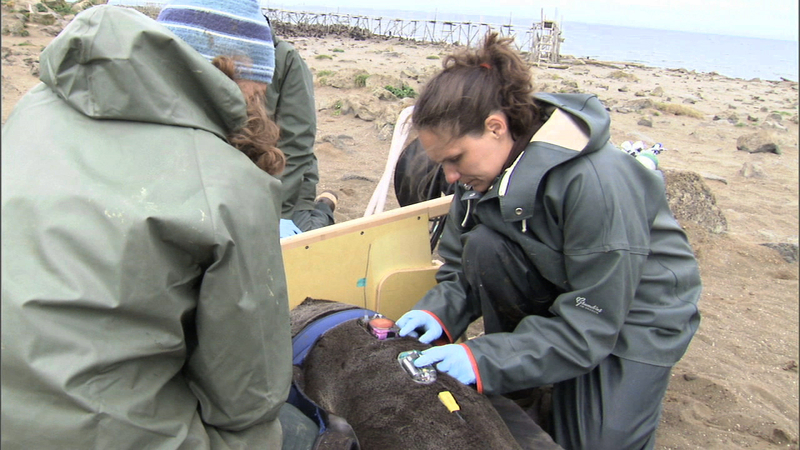 Back at their offices in Seattle, the researchers begin tracking tagged animals via satellites. This female's journey takes her south through the Aleutian Islands in just 3 days, traveling about 70 miles a day! Over the next two months, she travels straight across the open ocean to California covering about 3,000 miles. She feeds off the coast or in the open ocean for months, and even sleeps floating on the surface. As summer approaches, she heads back to the Pribilofs, but this time along the coast. Routes vary from individual to individual, but each seal travels on its own for about eight months and can cover over 6,000 miles! Believe it or not, this is 4th of July weekend on the Pribilofs. At Polovina Cliffs Rookery, the female tagged in November is back. Females actually return year after year to the same rocks where they gave birth the year before. In many cases, they were born in the same area themselves. Researchers know this because pups have also been tagged and tracked. Incredibly, they endure the same migration as adults and start out when they are only four months old. Sadly, the Pribilof fur seal population is declining, and it seems that fewer and fewer young animals are returning each year. Entanglement in garbage and other marine debris, increased predation and competition for food, along with climate change, may be impacting fur seal survival. The present Pribilof fur seal decline is not fully understood, but the key may lie in studying them along their wandering migration route. El Lejana en el abismo de niebla del centro del Mar de Bering, la Isla Pribilof fue encontrada, no por la vista sino por su sonido. En 1800, los comerciantes de pieles siguieron a la foca del norte hasta estas islas. Ellos descubrieron que las focas están allí solo en verano y en otoño. Hoy en día, los investigadores del Laboratorio Nacional de Mamíferos Marinos de la NOAA siguen a las migrantes focas para saber dónde se alimentan en los meses de invierno y de que recursos marinos ellas dependen para su supervivencia. Es principios de Noviembre y el equipo coloca un transmisor satelital a una hembra adulta. No la verán de regreso en la Isla Pribilof hasta el próximo mes de Julio, y ahora que está mudando, esperan que la marca se mantenga todo el invierno y la primavera. De vuelta en sus oficinas en Seattle, los investigadores comienzan el seguimiento vía satellite de los animals marcados. El viaje de esta hembra la lleva al sur a través de las islas Aleutianas en solo 3 días, ¡viajando unos 112 kilómetros al día! Durante próximos dos meses, viaja a lo largo de mar abierto hasta California, cubriendo cerca de 4,800 kilómetros. Ella se alimenta fuera de la costa o en mar abierto durante meses, e incluso duerme flotando en la superficie. Al aproximarse el verano, se dirige nuevamente a Pribilofs, esta vez a lo largo de la costa. Las rutas varían de individuo a individuo, pero cada foca viaja por su cuenta durante unos ochos meses y puede cubrir ¡mas de 9,650 kilómetros! Créalo o no, este es el fin de semana del 4 de Julio, en Pribilofs. En el Acantilado Rocoso Polovina, la hembra marcada en noviembre está de regreso. Las hembras de hecho regresan año tras año a las mismas rocas donde dieron a luz el año anterior. En muchos casos, ellas nacieron en la misma zona. Los investigadores saben esto porque las crías también han sido marcadas y seguidas. Increíblementer, ellas realizan la misma migración que los adultos y comienzan cuando solo tienen cuatro meses de edad. Lamentablemente, la población de la Foca Pribilof está disminuyendo, y parece que cada vez menos y menos animals jóvenes están volviendo cada año. El enredarse en la basura y otros desechos marinos, el aumento de la depredación y la competencia por los alimentos, junto el cambio climático, está afectando la supervivencia de las focas. La actual disminución de la Foca de Pribilof no se conoce completamente, pero la clave puede estar en estudiarlas a lo largo de su errante ruta migratoria. Northern fur seals are pinnipeds, a word which is derived from the Latin and means "fin-footed." Northern fur seals have the second thickest fur of any animal, second only to the sea otter. There are approximately 46,500 hairs per square centimeter on a northern fur seal.